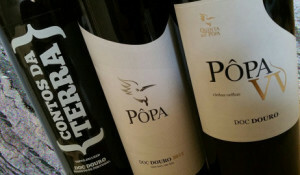 Quinta do Pôpa is a new name from Portugal’s Douro Valley, their vineyards acquired and expanded since 2003, and their first bottled wines released only in 2010. The Ferreira family own the estate, with second generation Stéphane Ferreira in charge of the wines – though Bairrada legend Luis Pato is their consultant winemaker. The estate consists of 30 hectares, of which 14 are planted to vine, including a substanial plot (three hectares) of vines that are over 80 years of age. Varieties are typical of the Douro, over twenty of them including Tinta Amarela, Tinto Cão, Touriga Franca, Tinta Roriz (aka Tempranillo) and Touriga Nacional. White varieties are planted too, again indigenous to the region. The wines are available to Europe-wide buyers via Prestige Wines of Portugal. Prices quoted included tax, though shipping to the UK costs around £25 per case of 12 bottles, so adding just over £2.00 to each bottle price. (2016) The entry level red blend doesn't specify varieties on the label, but is attracive with its tobacco-spiced nose of brambles and berries. In the mouth it is fairly lightweight and a touch short, but what's there is charming, with pert fruit and acidity and a touch of background tannin. (2016) Tinta Roriz, Touriga Nacional and Touriga Franca are joined by 20% of mixed, old field blend varieties. Much more solid, svelte and deeply fruited than the Contos da Terra, spice and liquorice edge the black fruits. In the mouth a nicely alert, juicy style with the bittersweetness of black plums and the tart juicy acidity playing against a touch of savoury, meaty character. (2016) The TR in question is Tinta Roriz, aka Tempranillo, here with dark and vinous aromas of black vine fruits, also coffee and a hint of mint. On the palate this is a substantial, smooth and supple wine, absolutely overflowing with juicy black berry sweetness of fruit, underpinned by that coffee and toast of the oak. The tannins are quite soft and velvetty, whcih with moderate acidity adds to the creamy and seductive picture. (2016) VV stands for Vinhas Velhas, or 'Old Vines', over 20 different varieties making up the blend from the farm's old mixed planting vineyards. Like the Tinta Roriz, we are back in full-on, seductive and velvetty mode here, with mocha and exotic spices and a bottomless pool of black fruit aromas. On the palate a touch more gamy interest than the TR, and a slightly leaner, higher acid structure too, this has freshness which it has traded for a bit of sheer decadence, but it is a fine wine and ageworthy too. Thanks, Tom. The one I have is the TR, but I figured as much! Hi Mark, I don’t have much experience actually, as these are the only wines I have tasted from QdPopa. I am assuming you bought the Douro Tinto 2008 rather than the Touriga or the Contos. While the 2012 certainly had a good dollop of oak, I suspect they may have reined it back a bit since 2008? These wines have good structure, but maybe time to try your 2008 fairly soon?